Our house has the usual linen closets, bookcases, and closets. You can check our floor plan for details. One thing to note is that we have a linen closet in each bathroom plus one between the master bath and master bedroom -- we found that we need every bit of that space. The following is just a discussion of some storage options we chose which are not always used or which require advance planning which you may need to be aware of. At the corner of the house built where the ground slopes down the greatest amount, there was enough headroom to put a storage room about 12'x17'. All of the house's under-floor space is walled in by concrete blocks, so two walls of the storage room are made up of concrete blocks. The other two interior walls of the storage room were framed with studs and sheetrocked. We originally intended to use this space just for storing lawn equipment, other outside items, a work bench and tools in the storage room. However, because the storage room under the house is, by necessity, at the lowest part of the lot, which also happens to be at the far corner from the front of the house and the garage, it is not convenient to put anything there which we would want to get to frequently, which includes either lawn equipment or a workbench. However, we have filled the room up with boxes of "stuff", including seasonal decorations, unused furniture, and other items we only rarely need to get to. The garage has a pull-down ladder for access to its attic for storage. However, it was many years before we actually put anything up there because we had so much other storage space. We probably could have lived without that space, but for the cost of a pull-down ladder, it's okay. The house does not need a pull-down ladder for its attic because the loft has a door which leads directly into the attic. Actually, the door leads into a small walk-through closet which has a door on the other side that opens into the attic. 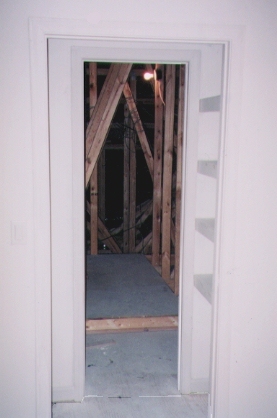 As mentioned in the "Framing" section, we had specified an area of the attic outside this door which would be cleared of joist framing and would have plywood decking for additional storage. 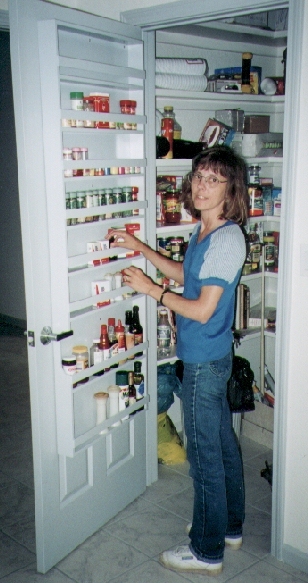 A walk-in pantry provides a lot of convenience. Having all of the food stored in one place lets you see and get to everything at once. It makes unloading groceries easier. A spice rack on the door increases storage space in the pantry enormously since all those little bottles can take a lot of shelf space. Putting them all in the rack makes them easier to find, too. With the pantry right next to the food-prep area, it is easy to reach a spice, use it, and put it right back in the rack. In the master closet, we had to choose where to have double poles (one clothes hanging pole up high and another down below it, which doubles the hanging space). Since most of Kay's clothes are dresses which need more room to hang, we single-poled most of her side of the closet (on the right) and double-poled a smaller area where she can hang blouses and skirts. Nelson's is just the opposite. Most of his space is double-poled for hanging shirts, and a smaller area is single-poled to allow room for hanging pants by the cuffs. 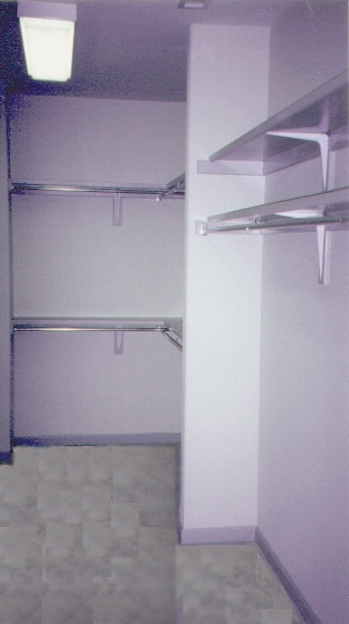 Cabinets built into the closet provide room for socks, underwear, sweaters, etc. The cabinets are on either side of the closet door. We squeezed the last inch of storage space out of the closet by having the cabinet builder add a bridge over the door from one cabinet to the other. In the picture, you can see the double-poled section on the left for Kay's short clothes and the single-poled section on the right for Nelson's slacks. Another thing that we might not have gotten without specifying it was to have wooden medicine cabinets built into the walls next to each vanity. It was important to plan for this in advance so doors and electrical wires could be kept out of the way and space for the cabinets could be allowed during the framing process. 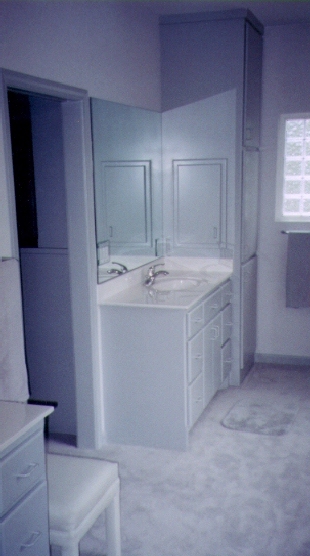 Both the guest bath's vanity and Nelson's vanity have a wall to the left of them, so there was no problem building the vanities into the walls. However, Kay's vanity butts up against a linen cabinet, so there was no choice but to build her medicine cabinet into the side of the linen cabinet. This worked out fine -- we don't even notice it when opening the linen cabinet. In the bathrooms, we used white cultured marble with molded sinks for the counter tops and matching marble for the shower and whirlpool in the master bath. It worked well in our last houses. The only question for this house was the height of the bathroom cabinets which the countertops would go on. Since Nelson is 6'4", we were going to make his cabinet a couple of inches higher than standard, and even though Kay is short, she decided she would rather have a higher cabinet too than to have cabinets of different heights. For her house, Judy chose an oval mirror to go over each of the two sinks in the master bath. The mirror swings out to reveal a medicine cabinet behind it which is recessed into the wall. 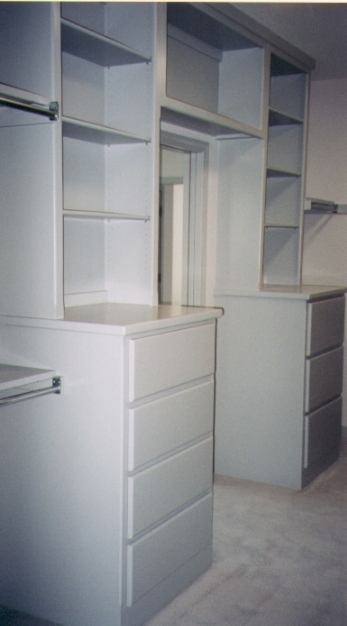 Judy's builder (Jim Buss) went back and forth quite a bit with the cabinet builder to make sure that the bathroom vanities got the drawers I had planned.